With no Derek Carr, it is rookie Connor Cook making his first start in his career. He is the first QB in the Super Bowl era to make his first career start, in the playoffs. Because of that, you can expect a heavy ground and pound game plan for the Oakland Raiders. That's exactly what we got on a near perfect opening drive by the Raiders. Latavius Murray and Jalen Richard combined for eight carries and 60 yards, helping the offense march into the redzone. However, on 3rd and 7, from the nine yard line, Cook missed a wide open Seth Roberts and was picked off by linebacker John Simon. 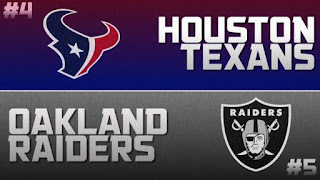 Luckily, the Raiders defense forced Brock Osweiler and the Texans offense to a quick three and out. With just 34 seconds left in the opening quarter, the Raiders strike first. Murray scores on a 4 yard run, set up by a beautiful catch and run by DeAndre Washington that went for 20 yards. After two drives, it looks like the Raiders offense has not skipped a beat without Carr under center. On the verge of a second straight three and out, Osweiler was able to hit tight end C.J. Fiedorowicz for 12 yards. The drive fizzled out as Khalil Mack recorded the first sack of the 2017 playoffs on a third down, forcing a Texans punt. Starting at their own 10 yard line, the Raiders get another good gain on the ground before Cook and Amari Cooper hook up on a huge 50 yard play down the sideline, on a perfectly executed play action pass. Once again, the Raiders are inside Texans territory. Two plays later, it was Cook getting it done with his legs. Facing heavy pressure from the 18 yard line, Cook was able to find some running room and dove towards the pylon for a touchdown, giving the Raiders a commanding 14-0 lead. Desperately needing a good drive, Akeem Hunt gave the Texans a short field to work with, thanks to his 42 yard kickoff return. After picking up two quick first downs, Osweiler hooked up with DeAndre Hopkins for the first time, a 15 yard pickup, before going back to him on two consecutive plays, which resulted in a 7 yard touchdown. This cut the Raiders lead to 14-7. That touchdown must have pumped up the Texans defense, as Jadeveon Clowney and Whitney Mercilus record back to back sacks on Cook, forcing a three and out. With under two minutes left in the half, the Texans offense took over at their own 47 but were unable to make anything happen. Again, the defense looked good. After giving the Raiders the ball back with 42 seconds left, Cook was on the run, trying to get out of bounds, but Clowney was able to bring him down forcing the fumble. It was scooped up by Andre Hal. This gave the Texans offense a chance to put points on the board before half, but Osweiler was picked off by rookie Karl Joseph on a shot to the end zone. The Raiders took a knee and a 14-7 lead into the locker room at halftime. The big take away from the first half was the run game between both teams. Murray led the Raiders with 89 rushing yards on 12 carries and the Raiders as a team rushed for 141 yards. Houston managed just 9 rushing yards and Lamar Miller was limited to just 3 yards on 5 carries. On the opening drive to start the second half, Osweiler was sacked by Khalil Mack for a third time but this time it resulted in a fumble and it was picked up by Malcolm Smith and returned 31 yards for a touchdown. After another Osweiler fumble, the Raiders added a field goal to put them up 24-7 after three quarters. Midway through the fourth, the Raiders looked to add another field goal but Sebastian Janikowski had his attempt blocked Robert Nelson Jr. The Texans capitalized with a drive that ended on a 3 yard strike to Will Fuller, cutting the lead to 10. Houston attempted an onside kick, but could not recover. They held the Raiders to a Janikowski field goal, keeping it a two possession game. However, the Texans were forced to go for it on fourth down at midfield and could not convert. Oakland got the ball back and ran the clock out, advancing to the divisional round with a 27-14 victory.